Share the post "Nasturtiums – A Gardener’s Dream"
If you are looking for a plant that will spread like wildfire, produce decorative foliage, have an ocean of brightly-colored blossoms, and be edible and tasty, there is the one you need for your garden: Nasturtiums. Tropaeolum, commonly known as Nasturtium, literally “nose-twister” or “nose-tweaker”, is a genus of roughly 80 species of annual and perennial herbaceous flowering plants native to South and Central America. Plants in this genus have showy, often intensely bright flowers, and rounded, shield-shaped leaves with the petiole in the centre. The flowers are bisexual and zygomorphic, with five petals, a superior three-carpelled ovary, and a funnel-shaped nectar spur at the back, formed by modification of one of the five sepals. Nasturtiums received their common name because they produce an oil that is similar to that of watercress (Nasturtium officinale). Nasturtiums were once known commonly as “Indian cresses” because they were introduced from the Americas, known popularly then as the Indies, and used like cress as salad ingredients. The best known species is Tropaeolum majus or Garden nasturtium, Indian cress or Monks cress, originating in the Andes from Bolivia north to Colombia. Nasturtium is mostly grown from seed as a half-hardy annual and both single and double varieties are available. It comes in a range of forms and colors including cream, yellow, orange and red, solid in color or striped and often with a dark blotch at the base of the petals. The flowers have a delicate fragrance that many people will remember from grandma’s garden. These little wonders require very little attention to thrive in your garden. Snails don’t seem to be interested in them. In mild climate they will even self seed and come back the next year. The best flowering will be in full sun, but they will tolerate partial shade. Seeds can be sown directly in the garden beginning in late May or started indoors, using peat pots and then planted directly in the soil, as nasturtiums do not fare well when transplanted. Once they are established, nasturtiums will continue to spread and bloom until the first frost. Don’t overwater them, but still an adequate water supply is vital for this plant in the hot summer months. Nasturtiums are not choosy about their soil, but prefer a light, sandy soil. Don’t spoil them with rich, fertile soil and fertilizers. Nasturtiums basically come in two forms: bush and trailing. They can be used as border plants, creating a colorful and dense edge or in window boxes, patio containers, or hanging baskets. The colorful blooms can be used either whole or chopped to decorate creamy soups, salads, butters, cakes and platters. Plant leaves contain vitamin C, and can be used to add a peppery flavor similar to watercress to salads, pasta dishes and a stir fry. Nasturtium’s spiciness is also a tasty addition to cheese spreads. More sun and heat, the spicier the taste. During World War II, dried ground nasturtium seeds were used as a substitute for black peeper. Both the leaves and the blossoms look and taste great in tea sandwiches. Nasturtium unripe seed pods are edible as well and have been likened to capers when pickled. Mix these ingredients and stuff the mixture into nasturtium flowers. Place stuffed flowers on a tray with nasturtium leaves. You can also stuff the blossoms with seasoned cream cheese mixtures, egg salad or chicken salad, just make sure that all ingredients are finely chopped to be able to stuff them into the tiny throat of the flower. One of the most colorful choices for filling is guacamole – a great summertime appetizer. 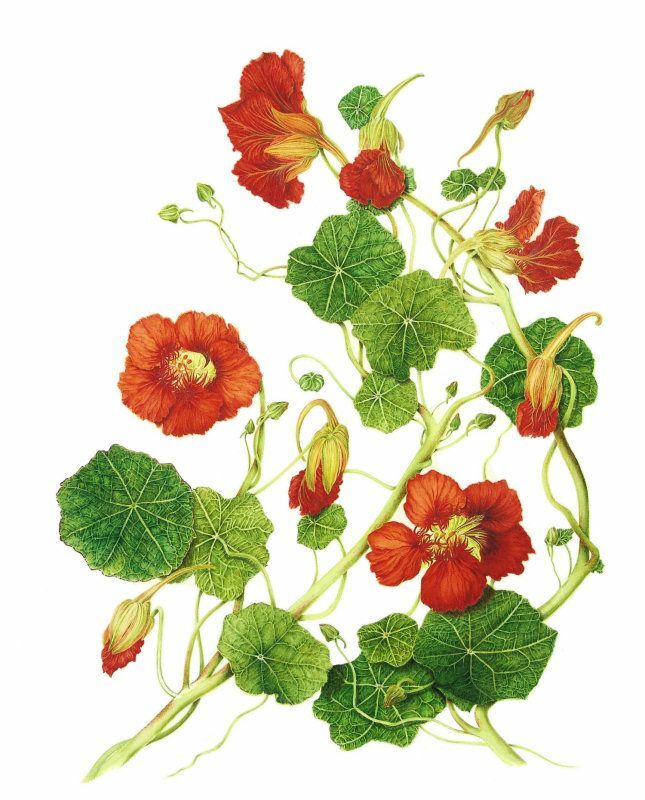 The main substances found in nasturtium are glucosinolates, mustard oil, flavonoids, carotenoids and vitamin C.
It was in the 1600s that the herb was first introduced from Peru to Europe, but it was used as a medicinal plant for a long time in South America. Nasturtium can act both as a disinfectant and a healing agent, and all parts of the plant seem to have strong antibiotic and antimicrobial properties. The leaves of the plant were used in a tea to treat coughs, colds and the flu, as well as menstrual difficulties, respiratory and urinary infections. Being high in vitamin C, nasturtiums act as a natural antibiotic, and as such were used topically as a poultice for minor cuts and scratches. Nasturtium has a reputation for promoting the formation of red blood cells, and it’s been used in folk medicine as a remedy against scurvy. The herb has been used as a remedy for hair loss and to stimulate hair growth. When applied externally, it also works against various fungal infections, including yeast infection. Additionally, it was used traditionally to treat muscular pain. Nasturtiums are also used in Ayurvedic medicine. The leaves are rubbed on the gums to stimulate and cleanse them. But despite its value as a medicinal plant and positive results in clinical trials, the freshness factor may be the reason why nasturtium is not a more widely used herb. 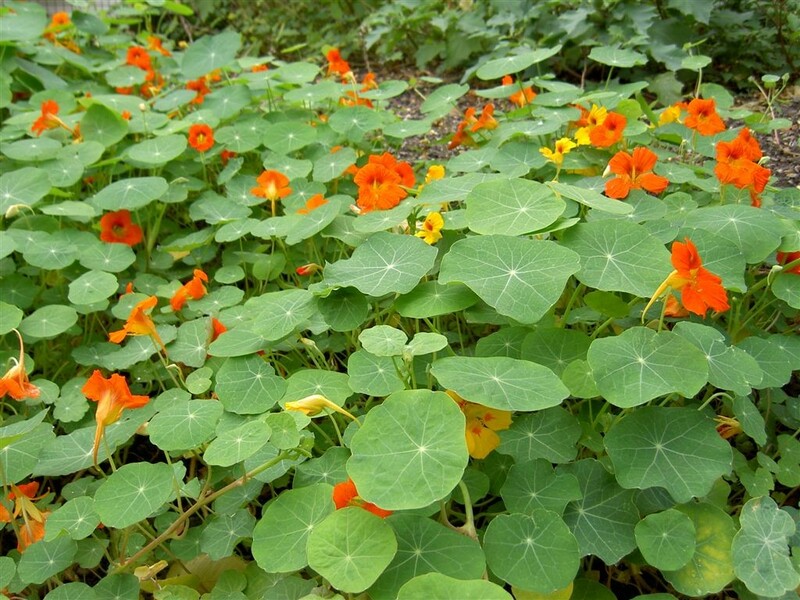 Safety notes: Nasturtium contains mustard oil and when used topically can cause skin irritation. Pregnant or breastfeeding women should not use this herb. People with kidney diseases or ulcers of the stomach or intestinal tract should not use this herb in any form either. Nasturtiums are also used as companion plants. They repel many cucurbit pests, like squash bugs, cucumber beetles, and several caterpillars. They have a similar range of benefits for brassica plants, especially broccoli and cauliflower. They also serve as a trap crop against black fly aphids. They also attract beneficial predatory insects. 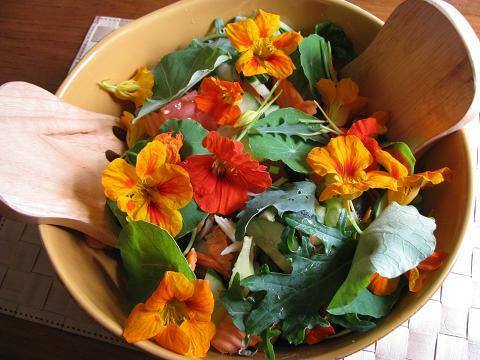 Do you grow Nasturtiums in your garden? What is your experience with this plant? Please share in the comments below! 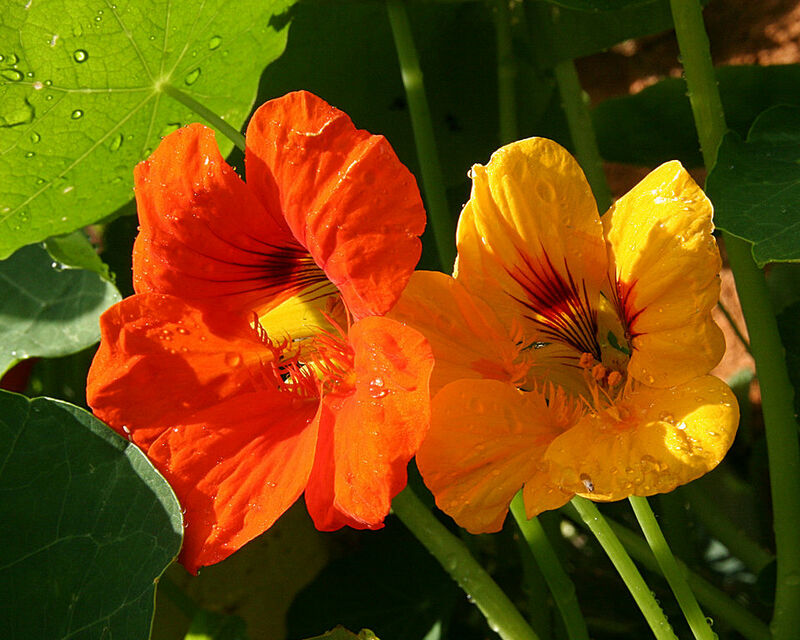 Do you sell Tropaeolum majus (Garden nasturtium) seeds or have plants for sale? You can place your advertisement here. Contact us now! Such an universal plant! Nature is really amazing and we need to learn to use it.